There’s a scene in the film Roxanne, in which Steve Martin, playing a fire chief who is nasally challenged, steps outside, sniffs the air, and announces that there is a fire. That’s how it is with me when I decide on a good day to rake the leaves of autumn. Today was one such day. When I walked outside, the air was crisp and still, the faintest hint of ice on the edges of the fallen leaves — a fine day to take my new rake out for a spin. After years of holding onto my ancient aluminum rake, the one with the head that always fell off, I purchased a new model from Home Depot. Anyway, today was the day to christen the rake. Joe thinks I’m bonkers, but I happen to like raking leaves. For starters, it’s a great excuse to be outside on a brisk autumn day. Otherwise, I would hibernate the day away with a nap and a movie. With my rake in hand, I’m breathing and alive. Then, of course, there’s the satisfaction of tidying up the yard — of righting the mess that Mother Nature made. Although I often envy peoples’ yards that are picked clean of any leaf debris, I have learned that that level of perfection is unnatural and something that I can never accomplish — mostly because my yard faces a”T” shaped intersection, and as the the wind blows, everyone’s leaves are blown into my yard. Besides, I like the spring-time thrill of cleaning the beds of leaves, when I can move them aside and spot the first hints of greenery poking up through the soil. Nevertheless, I have developed a system that works quite well for me. I begin by raking leaves into a large pile. Then, I place an environmentally friendly bag into my all-time favorite garbage can — yes, it is possible to have an all-time favorite garbage can. I place the lined garbage can on its side, and rake oodles of leaves into it. The garbage can’s opening is perfect for dumping in leaves, and when it’s full, its height is ideal for someone of my height to lift out. As I was raking, I wondered to myself, “What is the best part of this annual chore?” And then it hit me. It’s solitary. I became aware of the swoosh of the rake, the weight of it in my work-gloved hands, the sandpaper rustle of the leaves, the spring green color of the grass emerging from under the debris, and the gently sweet smell of the leaves. It was a positively Zen-like experience. That’s when the lawncare people arrived at my neighbor’s house, with their riding vaccuums and jet pack leaf blowers. Although I suffer from blower envy — I’m just not skilled in using the blower to make a pile of leaves — their work seemed impersonal. When I glanced in their direction, there was a definite disconnect in their eyes. Like an army of locusts, the crew swarmed over my neighbor’s lawn, their roaring engines robbing me of the solitude of my raking experience. 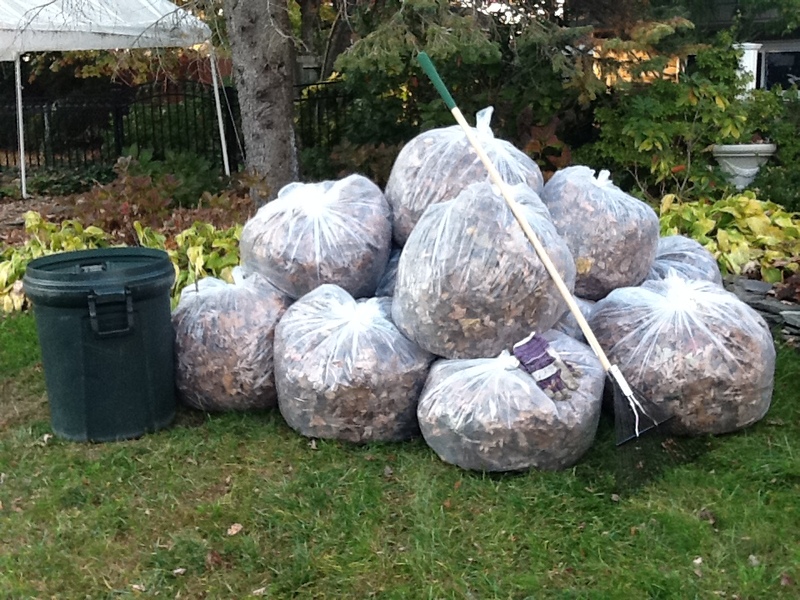 I raked on, and in minutes, they packed up and headed off to the next client. I looked skyward and saw the thousands of leaves that had yet to fall. Again, I was alone — with my rake, my leaves, my soul. ← What Happened To The “G” In HGTV? There was many a leaf war when I was a kid. We used to make giant piles and then hurl armfuls at each other — which, when I look on it, kind of defeats the whole raking thing. But there was nothing like watching the dog make a flying leap into the pile. All that fun, and no batteries to charge! Thanks for commenting. Exactly what I love about gardening … just me, my thoughts and maybe some birds, bees and my gardening companions (the dogs). Blissful solitude & peace! A great post Kevin! Thank you. Blooms and bounty are wonderful things about gardening — but it’s the bliss and peace and solitude that are the wonders. Cheers. Best gardening blog of the year. Only a real gardener knows what “favorite trash can” means. Forget those landscaping companies…they don’t know what they’re missing! Jane, always a treat to hear from you! Enjoy the passion on your side of the Atlantic! Cheers! Great post! I love being alone in the garden, lost in a chore, listening to silence. From now on, I’ll imagine an army of locusts whenever I see the ‘mow and blow’ guys! It’s odd, but when I’m alone in the garden, I cherish the soundtrack: a few birds, squirrels running up and down the trees, the sound of a shovel breaking ground, the slice of clippers trimming the hedge. That is peace. Thank you for your kind words. You can have too much silence, bird song etc. When I get to that point I put on my ipod and jig around. Kevin, I can guarantee that you leaves would be cleared away a lot faster as well as giving the neighbours a show. Like you, I’m a raking man, something my leaf-blowing, lawn-vacuuming friends find difficult to understand. Oh, well. 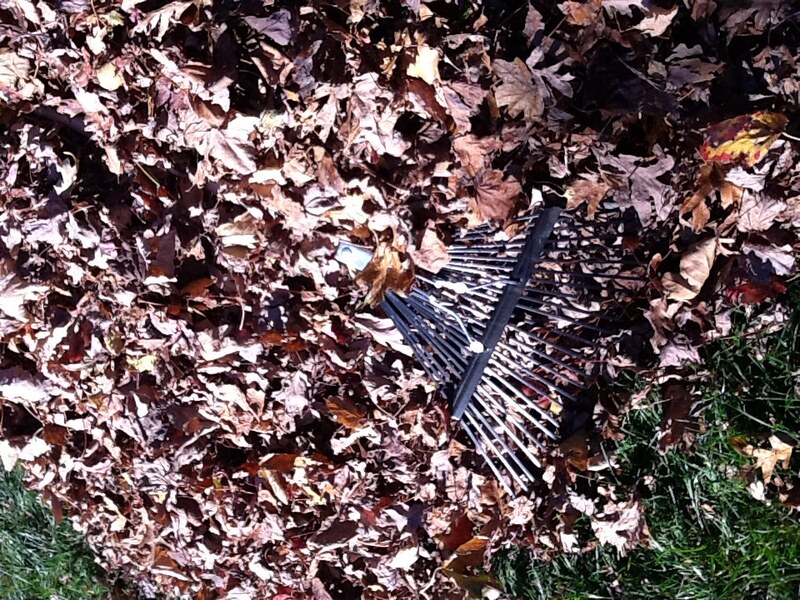 The joy of raking is one of the great mysteries. There are many people who may never understand what keeps us raking. Be well. I can see how raking leaves could be a meditation. There is more of a communing with nature while raking than while using the blower. I use so many of the leaves in my compost pile throughout the year. For me, the work week is filled with so much thinking and tension that the repetitiveness of raking (and the tranquility) actually eases the mind. Although I despise raking (it was an official chore of mine as a child) I can relate to the beauty of the moment captured in your post. Keep up the wonderful blogging! Glad it brought back a childhood memory — even though it may not have been a pleasant one. Thank you for your kind words and support.